In an alternate present-day version of Oakland, California black telemarketer Cassius Green (Lakeith Stanfield) discovers a magical key to professional success - which propels him into a macabre universe. Your enjoyment of comedy satire, Sorry To Bother You, will very much depend on whether you are willing to go on an increasingly bizarre journey with writer/director, Boots Riley. If you are happy to go on this trip, you will likely have an entertaining, baffling and thought-provoking cinematic experience. If you are unable or unwilling to follow the path laid out by Riley (in his debut feature), well you will likely - as many people did in my screening - walk out, feeling frustrated and bewildered. As for me, I loved Sorry To Bother You. The less you know going in, the better. Suffice to say, I would highly recommend this film, for all its bonkers madness. 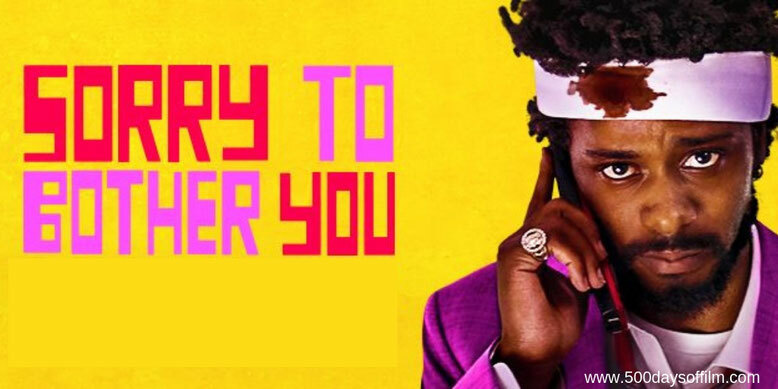 It is not perfect but I loved Sorry To Bother You's anger, its darker than dark humour and its inventiveness. I enjoyed the many moments of visual genius. I appreciated all the things this film had to say about our world - and Sorry To Bother You has a lot to say. Lakeith Stanfield is brilliant as Cassius (Cash) Green - his name just one of many deliberately unsubtle aspects of the film. Stanfield displays wonderful comic timing (as does David Cross as Cassius’s ‘white’ voice) and is a truly engaging screen presence. While not Riley’s first choice - both Jordan Peele and Donald Glover were lined up to play Cash - he feels perfect for this role. Stanfield is well supported by an impressive cast - including a psychotic and wonderfully unsettling performance from Armie Hammer. Effortlessly stealing the show, is Tessa Thompson as artist (and Cash’s long term girlfriend), Detroit. She is Sorry To Bother You’s heart and, often, its only hope for humanity. Riley’s movie is a satire on race, capitalism, modern slavery, the value of success, art and entertainment. These weighty themes are handled extremely well (with minimal exposition) in Sorry To Bother You’s first two acts. That things start to slide out Riley's control in the film’s final act is unsurprising, perhaps, given all of the many issues at play. However, I was more than willing to forgive Sorry To Bother You for any flaws. This is one of the most creative, enjoyable and ambitious films that I have watched all year. Have you seen Sorry To Bother You? If you have, what did you think of Boots Riley’s film? Let me know (I’d really love to know!) in the comments section below or via Twitter. You can find me @500DaysOfFilm.